Tim Flannery’s first major book since The Weather Makers charts the history of life on our planet. Here on Earth, which draws its points of departure from Darwin and Wallace, Lovelock and Dawkins, is an extraordinary exploration of evolution and sustainability. Our success as a species has had disastrous effects on many of the Earth’s ecosystems and could lead to our downfall. But equally, Flannery argues, we are now equipped as never before to explore our true relationship with the planet on which our biological, economic and cultural futures depend. Here on Earth is not just a dazzling account of life on our planet. It will change the way you live. 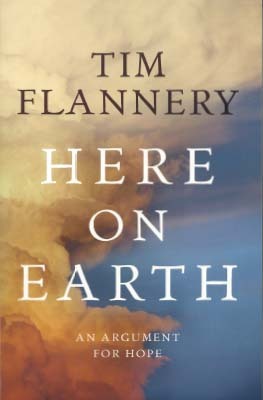 Tim Flannery has written over a dozen books, including Here on Earth; the award-winning bestsellers The Future Eaters, The Eternal Frontier and The Weather Makers; and his accounts of adventures in Papua New Guinea and Australia, Throwim Way Leg, Country and Among the Islands. Tim was the 2007 Australian of the Year and the Head of the Australian Climate Commission from 2011–13. Tim Flannery is a founding member of The Climate Council, an independent non-profit organisation funded by donations from the public. The Climate Council’s mission is to provide authoritative, expert advice to the Australian public on climate change.